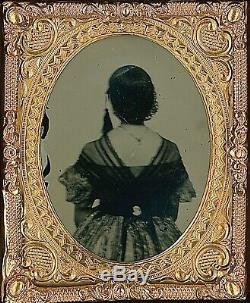 This clear glass ambrotype features a young woman with her back to the camera. This is a very rare view. The 1/9 plate was resealed with its original glass and the case measures about 2.5 x 3 inches. The item "Rare Woman Taken From Behind Back To Camera 1/9 Plate Clear Glass Ambrotype A167" is in sale since Sunday, March 3, 2019. This item is in the category "Collectibles\Photographic Images\Vintage & Antique (Pre-1940)\Ambrotypes". The seller is "10michaelps951" and is located in Park Ridge, Illinois. This item can be shipped to United States, Canada, United Kingdom, Denmark, Romania, Slovakia, Bulgaria, Czech republic, Finland, Hungary, Latvia, Lithuania, Malta, Estonia, Australia, Greece, Portugal, Cyprus, Slovenia, Japan, China, Sweden, South Korea, Indonesia, Taiwan, South africa, Thailand, Belgium, France, Hong Kong, Ireland, Netherlands, Poland, Spain, Italy, Germany, Austria, Bahamas, Israel, Mexico, New Zealand, Philippines, Singapore, Switzerland, Norway, Saudi arabia, United arab emirates, Qatar, Kuwait, Bahrain, Croatia, Malaysia, Brazil, Chile, Colombia, Costa rica, Panama, Trinidad and tobago, Guatemala, Honduras, Jamaica, Viet nam, Uruguay.